pickles Vegetables have traditionally been eaten fresh, added to stews and pickled in brine. In the old days families made their own pickles and houses had storage area for pickles. Now, most people purchase them at stores. In some places people use lactic acid bacteria to pickle the leaves and stalks of red beets to make sunki, which adds a unique tart flavor to soba. 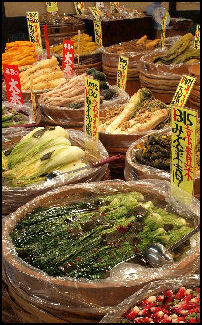 The variety of vegetables is staggering and the vegetable concoctions the Japanese dream up are delicious. Among the more unique varieties are tomburo (seeds from the broom plant, known as “caviar of the field”), slightly bitter shokuyogiku (edible chrysanthemum pedals), mountain mizu (crunchy, marble-shaped buds), and mountain vegetables such as warabi (bracken), udo (Aralia cordata) and makurage (stem lettuce). The Japanese are very fond of massive white radishes ( daikon ), cabbage, sliced lotus roots (known for their wagon-wheel shape and crisp texture, often deep-fired as tempura), burdock (a high-fiber root with a nutty flavor) and mountain yams (cooked in starchy mass served with soup, noodles or fresh tuna). Spinach is a symbol of secret love. Giving someone a present wrapped in spinach-green paper is an expression of passion. Vegetables can be very expensive in Japan. Prices have come down considerably in the last few years thanks to cheap imports, primarily from China. A variety of pickled vegetables are available. Pickling things like Chinese radishes with nukamiso (smelly fermented rice bran) in a ceramic pot has traditionally been a way of preserving vegetables for the winter months. Popular Japanese pickles include takuan and umeboshi. Kyoto is especially well known for pickles. In recent years, organic produce has become popular. Japanese consumers are very health conscious and they don’t seem to be too concerned about shelling out twice as much money for vegetables that look less appetizing because no preservatives have been added. The market for organic food became very big after a series of scares and worries about genetically-modified foods. Farmers were happy about the development because it gave them a chance to make some good money. Eggplant is very popular in Japan. Japanese eggplants are longer, thinner than conventional eggplants and have smaller seeds, thinner skin, smoother flesh and have a sweeter, less bitter taste. They are used for main dishes. Broad beans are usually boiled in water with salt and served as a snack to accompany drinks. 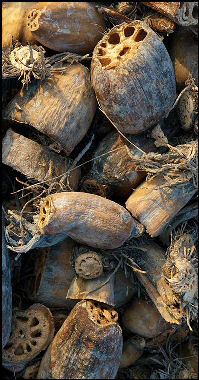 Rawan butter is a plant with soft , juicy stalks that grow to a height of three meters. In Hokkaido pumpkins are “grown in the air” on vines wrapped around special farms. The unusual growing method reduces the numbers of pests and give the pumpkins a better shape and color and little variation in quality. lotus root Lotus root is cut in slices that look like wagon wheels. A traditional New Year's food that is believed to bring good luck because there are may holes through which the future can be seen, it can be raised in the winter and is grown in flooded rices paddies and ponds. They are harvest in December, often when the water is quite cold, by farmers who sink to their waists in the mud and water and pull the roots out of the muck by hand. Ibaraki prefecture is the largest producer of lotus roots. Two primary kinds of cabbages are eaten in Japan: 1) kandama (“cold round ball”) cabbages, sold from June through February that have dense, packed leaves, taste best cooked and used in Japan in okonomiyali pancakes and an ingredient in gyoza (Chinese dumplings); and 2) spring cabbages, sold from March to May, featuring lighter, less dense heads with leaves that taste good raw and are often used in salads served with pork cutlets at restaurants. Chinese cabbage is used in nabe stews and to make kim-chi. It is leafier and longer than regular cabbage. The best is said to be Kokufu Hakusai from Takasaki in Gunma Prefecture. Selling for about a dollar more than other kinds, it has soft leaves and a strong flavor. A typical cabbage weighs five kilograms. One harvested at the end of the season in mid December can weigh up eight kilograms. The village of Kawakamo in western Japan has been called the richest village in Japan, with farmers earning six figure dollar incomes and driving Mercedes. The village was dirt poor until 1989 when it began switching from rice to lettuce as its primary crop. It just so happens the village is at perfect elevation (1,350 meter) for growing lettuce and water in the local river has just the right mineral content to produce delicious lettuce that is widely sought both in Japan and abroad by connoisseurs. Lettuce was traditionally not part of the Japanese diet. Japanese farmers began growing it for American soldiers during the postwar occupation. Leeks are essential ingredients in soba, yakitori, shabu shabu and sukiyaki. Leeks with vivid white and green sections are said to be the tastiest. The best leeks in Japan, the Senju-negi variety, are twice as thick as normal varieties and have longer white sections and have as many as 10 layers. sweet potato truck Yaki-imo (baked sweet potatoes) are a treat that is enjoyed in the winter months. Many people buy them from the yaki-imo man who roasts sweet potatoes over stones in a small wood burning stove with a pipe for smoke. The sweet potatoes are ideally cooked on smooth river stones. 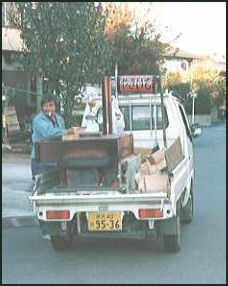 Many vendors get their firewood fire from recently demolished houses. The heat is kept around 70̊C, the temperature at which starch converts into sugar. Sweet potatoes are usually harvested in September but is said that taste sweeter and better if they are stored for a month or two under controlled temperature and humidity, maturing in late November. Heating them makes them sweeter still as the starch becomes past-like at about 70 degrees C and enzymes turn the starch into malt sugar. Sweet have traditionally been enjoyed two ways during the winter: stone baked and sold from the back or a truck or jar-baked with charcoal placed under a one-meter tall unglazed jar wheeled the streets in a two-wheeled cart. Slow-baking helps convert the starch into sugar. In the old days the men who pushed the sweet potato carts through neighborhoods shouted out a song "oimoo-o-o-o ya-a-ski-imo" (“Roooassted potaaatoooos! They’re so delicious.”). The custom originated after the Great Tokyo Earthquake in 1923 when they brought food to people whose houses were in ruins. Vendors have traditionally carefully guarded their turf, with trouble breaking out if a vendor’s territory was breached. These days hot sweet potatoes are mostly sold from trucks that make a whistling sound and wind through neighborhoods with taped version fo the sweet potato song being played over and over again. 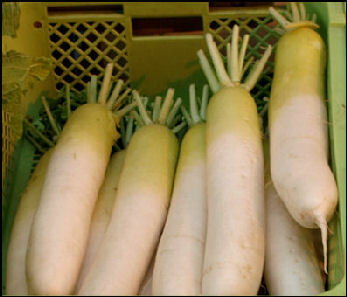 daikon Large white carrot-shaped radishes, called daikon, are Japan's favorite vegetable in terms of planted acreage. Cheap and sold throughout the year, they can be truly massive---as thick and as long as a man's arm and weighing several kilograms. They are easy to grow and harvest and flourish in the winter. Many farmers plant it in the autumn and harvest in the winter or spring. It is said the best tasting are harvest at dawn in frosty mornings in January and February. More than 100 different kinds of daikon radishes have been grown in Japan. Most are long and thick but there also round varieties. Aokubi daikon, which vary in size and thickness from a rolling pin to a bowling pin, account for 95 percent of production. The tastiest ones are said to come from the Miura Peninsula south of Tokyo where it is said that ocean breezes enrich them with minerals. Radishes made their way to Japan from China via Korea. It is not known whether radishes originated in Asia or evolved from Mediterranean varieties that were brought eastward on the Silk Road. Radishes have been eaten for at least 5,000 years. They were among the rations eaten by the builders of the pyramids in ancient Egypt. Bamboo shoots are a popular food and are often harvested by people from bamboo groves near their homes. Known as takenoko (bamboo babies), they are gathered in the early spring and dug up by hand. Takenoko is added to soups and stews and is sliced and grilled on barbecues. It needs to be boiled before it can be consumed. People hunting for bamboo babies look for slight mounds of earth at the beginning of spring. The best ones haven’t emerged from the ground yet and it takes some probing of the ground to find them. Increasingly mild winters have moved the season up to February. Bamboo shoots are known as takenoko in Japan. Those from the maso bamboo found around the town of Otakimachi in Chiba Prefecture are regarded as among the best in the country. They have a pear-like texture and slightly sweet flavor and can be eaten uncooked like sashimi. Locals say the clayey soil there produces bamboo shoots that have a fresh flavor but aren’t bitter. Experienced bamboo shoot hunters use a special pick-ax-like hoe to dig up the shoots and can find shoots that haven’t broken the soil surface in what seems like ordinary ground. Soil is removed from the shoot before it is dug up. A white color means the shoots have not been exposed to air, promising a bitter-free taste. The inner parts of the shoot, which are revealed after pealing away the outer layers, are the sweetest and most flavorful parts of the shoot. The mizu-nasu season lasts longer than that of other eggplants. From April to June, it is grown in greenhouses while field-cultivated mizu-nasu are available from June to September. Workers at a pickle factory for Shunka, a company in the Senshu area near Osaka that is a major producer of mizu-nasu pickles. Workers there first wash the eggplants before removing their hulls. They then gently massaged the vegetable using solar salt. "If the eggplant's surface is lightly scored, salt can penetrate its center. When this occurs, the eggplant is able to fully absorb the flavor of nuka [a rice bran culture used as a pickling medium], which is the next step when pickling eggplants," the manager at the factory explained. I tasted mizu-nasu that had been pickled for two days, apparently the best time to eat them. I was told to make shallow incisions in the eggplant with my fingernails before pulling it apart. "If you use a knife to slice mizu-nasu, the knife's metallic ‘smell' will react with the eggplant," the manager said. The salt brought out the eggplant's natural sweetness. Moreover, the rice bran added depth and flavor to the piquant pickles. The mizu-nasu tasted like a fruit, almost suitable for dessert. Fruit is often eaten as a desert and is usually pealed and eaten with a fork. Great care is taken so the fruit look good and is well presented in supermarkets. Japanese apples can sell for as much as $5 a piece. They are often individually wrapped on the tree for protection and polished before they are sold. Aomori is famous for apples. The usagi ringo (“rabbit apple”) is a piece of apple with the skin cut and pealed back to look like the ears of a rabbit. They have traditionally been fixtures of bento box lunches, and making them has traditionally been seen as sign of being a good parent and host. In a 2008 survey, 35 percent of Japanese parents in the 20s, 30s and 40s said they did not know how to make the special apples. Umeboshi ”pickled plums”are eaten by many Japanese athletes who swear they give them energy and stamina. Umeboshi’s high concentrations of citric acid are said to be the secret behinds it fatigue-stopping powers. A quarter of Japan’s plums come from a single town, Minabecho, in Wakayama Prefecture. About 14,000 people live on the main hillside of the town and nearly all of the town’s 1,500 framing households raise plums or are involved in plum-producing businesses. Japanese pears are very good. They are round rather than pear-shaped and have a thick skin and firmer, more flavorful flesh than American pears. Pickled plums are very common in Japan. Plums have been regarded as a life-prolonging fruit for centuries. Chiba is the largest pear growing prefecture in Japan. Pears grow bigger and tastier there than in other places where there are large temperature variations throughout the summer because the temperatures in Chiba are stabilized by its nearness to the sea. Some of biggest and tastiest Chiba pears weigh over one kilogram. round pears Japan gets many of its bananas from plantations in Vietnam. In early autumn of 2008 there was a banana shortage initially caused by television programs and books that claimed eating bananas helped people lose weight. When the shortage began to take hold panic buying made it worse. The shortage lasted for a couple of weeks. Shelves were empty; prices were high. Increased imports of bananas produced plentiful supplies a short time later. The boom started when a claim was made that bananas and room-temperature water lead to weight less. The claim was given a boost when a television personality tried the diet. A vending machine offering fresh bananas installed in Shibuya near the trendy 109 fashion complex in 2010 has been well received. Selling individual bananas for ¥130 and bunches for ¥390, more than 2,500 bananas were sold the first month. box-grown watermelons Single cantaloupes sell for more than $100 in Japan. Known as melons, they have green rather than orange flesh and are carefully attended and grown in greenhouses and sold in special boxes with a ribbon around the fruit. One reason they are so expensive is that they have traditionally been given to people in hospitals, where giving something that is expensive is an expression of love. To ensure that melons have a perfect round shape they are sometimes grown in the air hanging from strings. Upon request melons can be grown in special boxes so that they come out pyramid- or square-shaped. The square one are designed to fit in refrigerators and produced primarily around the city of Zentsuju in Kagawa prefecture. It is also possible to buy apples with a personal message grown into the skin. 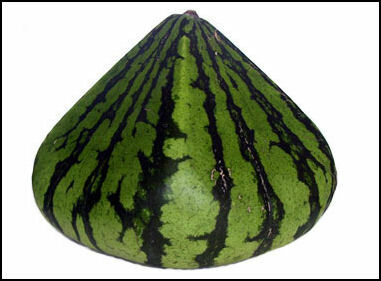 Melons from Yubari in Hokkaido are highly-regarded and have particularly a high sugar content. In 2006, the first pair of melon sold at auction for the city were sold for $7,000. The year 2004 was a particularly good for these melons; they were larger and sweeter than usual. At one auction 98 melons were sold in less than 20 minutes for a total of almost $300,000. One pair was sold for a record at the time of $4,100. A pair of Yuibari melons was sold for $20,000 and $25,000 receptively in 2007 and 2008. In May 2009, pair was sold for $5,000. A pair of yubari melons was sold for $16,500 at an auction in May 2010. Most watermelons are shipped in July and August. Ideal watermelon-growing areas have big temperature differences between day and night and soil compacted by heavy winter snows, which helps the soil retain water. Watermelon processing centers have devices that check the sugar content of watermelons and determine whether or not they have a hollow center. Those with low sugar contents and hollow centers are rejected. Watermelon production is declining somewhat because farmers are becoming older and they are having a hard time lifting the fruit which can weigh 10 kilograms or more. 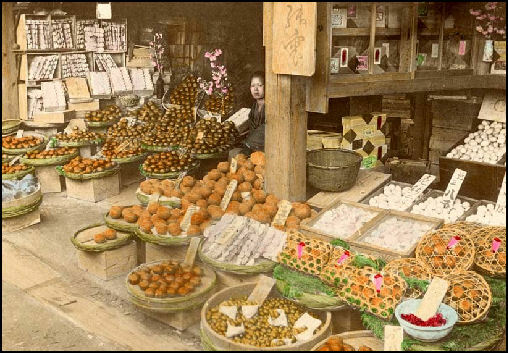 The Japanese love persimmons (cokis). They are a popular autumn fruit. There are two kinds: 1) the sweet kind that are eaten straight of the tree after the skin is cut off; and 2) the sweet but slightly bitter kind that os dried. Persimmon wine and freeze-dried persimmons are also available. Dried persimmons, known as Hachiyagaki, have traditionally been served during the tea ceremony. After they are harvested they are stored for several days and then peeled, They are peeled again when the fruit is as soft as an ear lobe. After that they are dried in the sun for 20 days. During that tume they are turned over twice a day and gently squeezed which brings a sweet, white powder to the surface. 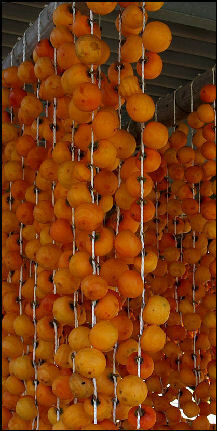 It takes great skill to dry persimmons correctly. Persimmons are high in fiber, Vitamin A, potassium and the phytochemcials lutien and lycopen, which are said to help the body fight disease. Some kinds of persimmons are high in tannin oil, an ingredient in many medicines and cosmetics and is said to lower blood pressure and fight cancer and viruses. In Chinese medicine persimmons have traditionally been used to nourish the lungs and heart and treat diarrhea. Persimmons trees can live up to 100 years and bear 200 kilograms of fruit a year, The cultivation of persimmon originate din China. Then spread to Korea and Japan. In the 16th century persimmons were the size of grapes and were used to make some of the first alcoholic drinks made by Europeans in the Americas. Persimmons grown on about 300 farms in Nishi-Yoshinomachi, Gojo, Nara Prefecture are said to be among the tastiest in Japan if not the world . "This area is in the mountains 200 to 300 meters above sea level. As it's blessed with plenty of sunlight and good air circulation, it's suited to growing persimmons," a persimmon farmer told Yomiuri Shimbun, Trial and error in the pursuit of growing unparalleled persimmons has led the farmer to enrich his farm's soil with fully fermented compost and minerals such as magnesium. The farm---Okada Persimmon Farm in Gojo--- has more than 1,000 persimmon trees and grows about 100 tons of the fruit a year. Yuzu, a winter fruit, is too sharp to eat fresh because of its strong and penetrating aroma, but it has a variety of uses. For example, on the day of toji (winter solstice), yuzu-yu--taking a hot bath with yuzu floating in it--is customary. When I was a child, my mother made a small bag of soft cotton cloth, put plenty of yuzu in it, and put the bag in the bathtub so that we could enjoy aromatic yuzu water, which is said to be good for the skin. On Jan 1, when we eat zoni, the final step in preparing it is to scrape off small bits of yuzu zest and place them on top of each serving of zoni in wooden bowls. The wonderful aroma, a mixture of the savory soup and the yuzu fragrance, makes everybody feel that the New Year has come. Even if you resort to store-bought osechi dishes, you can still scoop the yuzu pulp out of its rind to make a yuzugama (a yuzu cup or pot) and arrange some simple appetizers in it to give your dining table a special New Year's atmosphere. When I make osechi, which is presented in a multitiered lacquer box, I make it a rule to include a yuzu cup with ikura salmon roe or yuzu-flavored kohaku namasu (red and white marinated daikon and carrot). During the winter, I make various yuzu desserts as well--cookies with yuzu icing, yuzu cheesecake, yuzu madeleines and so on. If you suddenly decide to visit your friends or relatives and can't think of what to bring, I recommend baking yuzu madeleines, which can be easily made in half an hour. This very simple homemade confection with yuzu fragrance is sure to please anyone and makes an apt gift for the New Year's period. And yuzu sweets aren't limited to madeleines. Simply replacing the lemon juice in your dessert recipes with double portions of freshly squeezed yuzu juice is all it takes to create your own original yuzu treat. Even store-bought plain cookies can become your own original ones with yuzu icing. So, if you feel it is too late to prepare special dishes for the New Year, I recommend that you buy a small basket of yuzu, preferably small, golfball-sized yuzu with leaves, at a grocery store. They will give your kitchen a very special atmosphere and will definitely be enjoyed in various ways during the New Year's holidays!